"Subdivision of the Chilver estate, coming with the first glimmerings of development, marked the end of the farm as one complete strip of land, and ushered in an era of advance that is seen today in the lavishly-built area that borders on Victoria [Chilver] Road." You probably think Chilver Road starts at the river and runs south a few kilometres to Memorial Drive in South Walkerville. But Chilver Road is much longer than that. In fact, its roots stretch all the way to Plymouth Rock in 1620 when a descendant of the wife of its namesake, Charles Lewis Chilver, crossed the Atlantic to the New World from England. Arriving in Plymouth, Massachusetts on the Mayflower, this adventurous family eventually settled in Philadelphia. They proliferated and around 1760, a child named John Casper Fulmer was born. Sometime during the Revolutionary War of 1776, he settled in Mersea Township, in the County of Essex. He moved further north to Concession 3 and eventually owned around 700 acres of land. He found a local girl to his liking named Ann Fox and they married and had seven children. A son of theirs named John married Betsy Wilkinson, who bore him four children. Their son, Francis Casper Fulmer, was born in 1835. At the age of 16, he took over his fathers farm and then moved to Windsor in 1871 to start a livery business and a hack and sale stable. He did very well buying and shipping horses to the United States for use in the calvary. Phoebe Jane McQueen became his bride in 1856. Previous to this, Victoire Maisonville, whose husband had served in the War of 1812, received a Crown grant of land in what was to become Walkerville. One of their daughters, Eliza Grier, married Captain Thomas Chilver, a prominent figure in early "border city" days. He was owner of the ferry "Gem" which ran between Detroit and the Canadian side. Almina Elizabeth Fulmer, first-born daughter of Francis and Phoebe, married Charles Lewis Chilver, son of the captain and Eliza in 1879. 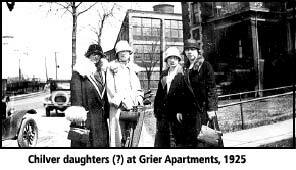 They had seven children: Henry Lewis, Frances Warren, Charles Alonzo Grier, Florence May, Mildred Priscilla, Lettie Elizabeth and Almina Jane. 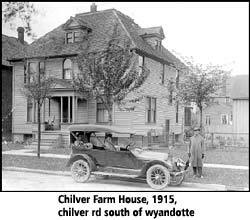 Charles Lewis Chilver was the owner of the Chilver Land and Building Company and subdivided his grandmother Victoires grant, which had become the family farm (farm plot #23), and extended from the Detroit River south to Tecumseh Road along the line now defined as Chilver Road. Among Chilvers buildings were the commercial buildings on Wyandotte between Chilver and Jubilee Park (Peerless Ice Cream is in the corner unit), the commercial building at the corner of Chilver and Ottawa going east, the terrace homes on Chilver just north of Cataraqui (named after two daughters: May and Mildred) and the large frame house on Chilver and Cataraqui on the northwest corner. The family farmhouse used to sit on the corner of Chilver and Wyandotte but was moved back to allow for the building of the Merchant Bank (later Bank of Montreal). The farmhouse still stands next to the Complex parking lot and there is a log home opposite the Victoria Tavern on Chilver near Assumption that was once the stable. A member of Walkerville town council, C. L. Chilver was also a member of the board of education, Chief Magistrate and Mayor of Walkerville in 1909 and 1910. He was born Dec. 10, 1850 and died in the 1920s in his home in the Grier apartments (still standing on Riverside at Chilver), which was owned and built by himself and named for his mother Eliza, on the site where he was born in the pioneer Border days. Chilver Road, originally named Susan Rd., was renamed Victoria Rd., after Charles grandmother Victoire. 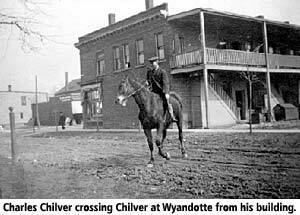 When Walkerville was amalgamated with Windsor, the roads name changed to Chilver as there was already a Victoria Ave. in Windsor. 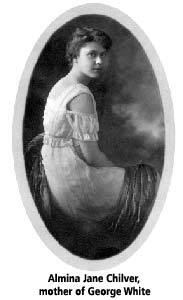 Almina Jane Chilver, one of Charles daughters, married Windsor pediatrician Dr. George E. White. Their children included George E. White, who was the owner of Geo. E. White & Son, Ltd. (building supply). George and his sister, Ann Jasperson of Stouffville, have provided The Walkerville Times with information and photos about their family. Watch for other stories on this fascinating family in future issues.